Religious conversion - a shift in membership from one community of faith to another - can take diverse forms in radically different circumstances. As the essays in this volume demonstrate, conversion can be protracted or sudden, voluntary or coerced, small-scale or large. It may be the result of active missionary efforts, instrumental decisions, or intellectual or spiritual attraction to a different doctrine and practices. In order to investigate these multiple meanings, and how they may differ across time and space, this collection ranges far and wide across medieval and early modern Europe and beyond. 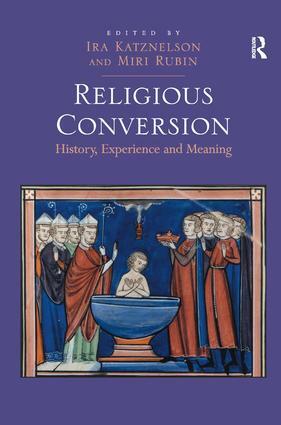 From early Christian pilgrims to fifteenth-century Ethiopia; from the Islamisation of the eastern Mediterranean to Reformation Germany, the volume highlights salient features and key concepts that define religious conversion, particular the Jewish, Muslim and Christian experiences. By probing similarities and variations, continuities and fissures, the volume also extends the range of conversion to focus on matters less commonly examined, such as competition for the meaning of sacred space, changes to bodies, patterns of gender, and the ways conversion has been understood and narrated by actors and observers. In so doing, it promotes a layered approach that deepens inquiry by identifying and suggesting constellations of elements that both compose particular instances of conversion and help make systematic comparisons possible by indicating how to ask comparable questions of often vastly different situations. Ira Katznelson is Ruggles Professor of Political Science and History at Columbia University, New York. Primarily an Americanist, his work has straddled comparative politics and political theory as well as political and social history. He is President of the Social Science Research Council, and was President of the American Political Science Association for 2005-2006. Previously, he served as President of the Social Science History Association and Chair of the Russell Sage Foundation Board of Trustees. He has been a Guggenheim Fellow and is a Fellow of the American Academy of Arts and Sciences and the American Philosophical Society. His most recent books are ’Fear Itself: The New Deal and the Origins of Our Time’ (2013), ’Liberal Beginnings: Making a Republic for the Moderns’ (with Andreas Kalyvas) (2008), and ’When Affirmative Action Was White: An Untold History of Racial Inequality in Twentieth-Century America’ (2006). Miri Rubin is Professor of Medieval and Early Modern History and Head of the School of History, at Queen Mary, University of London. Her research has ranged across the period 1100-1600, introducing fresh approaches to the study of social relations in the predominantly religious cultures of medieval Europe. Her publications include: ’Charity and Community in Medieval Cambridge (1987); ’Corpus Christi: the Eucharist in Late Medieval Culture’ (1991) and ’Gentile Tales; the Narrative Assault on Late Medieval Jews’ (1999; repr. 2004).